Catechesis, Advocacy, Worship, Guidance and Counseling, Justice and Service, Community, and Enablement. 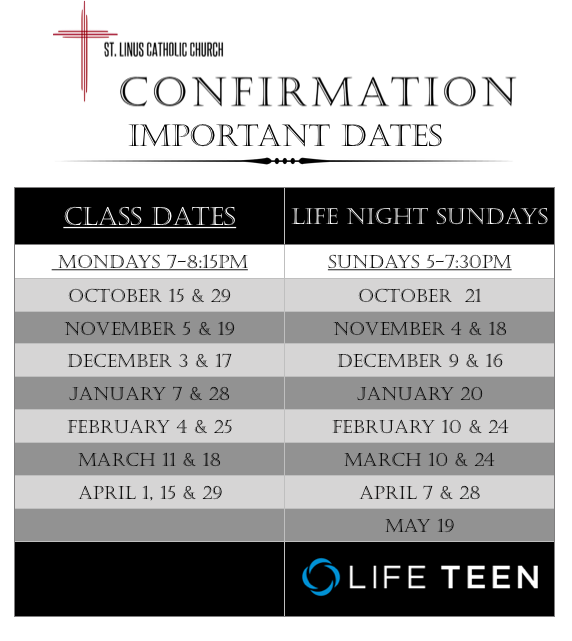 Activities are required for Youth preparing for Confirmation, but are open to all Youth. Ministry is done by a team of adults and young adults who possess a mature Catholic faith and who have committed themselves to helping teens discover the presence of God through the Gospel of Jesus Christ. We are called to initiate, teach, nurture, and support the gospel of Jesus according to the framework of the Catholic youth ministry, Renewing the Vision. We endeavor to empower young people to live as disciples of Jesus Christ in the world today, to draw Youth to responsible participation in the life, mission and work of the Catholic Church, and to foster the total personal and spiritual growth of the young people in our faith community. Parent Orientation Meeting – September 23rd at 3:15 pm in the Church. Students must complete at least 20 hours of service at Parish. Parents must assist with at least one Parish service project.